I am editing a web-magazine about the South Pacific, and during my research on the ancient statues on the islands I discovered that some of them had six fingers. And to my surprise: So had ancient statues all over the world! To have six fingers on each hand and six toes on each foot is called polydactylism, and is common in ancient texts and art. But is it just folklore, or did this phenomena exist? And why have we not learnt about it in school - why is it like the archaeologists are trying to keep this interesting fact a secret? Luckily, we today have the internet where we can share information, - so let's us together try to find the truth! I believe the answer might be very interesting - and even important. Without knowing the whole truth about the past we might not have a future we can trust! Stone cannot be carbon dated, so it is often impossible to tell how old ancient statues made of stone are. And often the stories about them are forgotten or changed. Missionaries have destroyed many of the statues, to get rid of what for them represented ungodly ceremonies and believes. Wars have taken its toll, the victorious worries often torn their enemy's identity and culture apart. And archaeologists have stowed ancient statues away in dusty storage-rooms in the museums, to make room for new exhibitions - or get them out of sight. Yes, they might even have been ordered to do so by the authorities. Governments don't want stories that can shake or change the history we know; it might have national and international implications. The phenomena with six finger and toes very often goes hand in hand with texts and stories about giants: Like Goliath in the Bible - he had six fingers and toes! 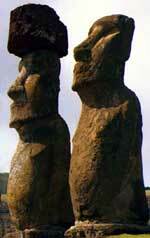 And take a look at the statues you find on the islands in the Pacific - most of them have gigantic proportions. Did the makers of the statues in that way try to keep the memory of their gods, gods that to them were very real? Did it in fact exist beings looking like us humans, but that were 8-12 feet (2.4-3.6 meters) tall and had six fingers and toes (to read my webpages about the giants - click here)? - they too lived in heaven. But not a theological heaven - they came from outer space. The stars. Why do we so often find ancient statues with six fingers and/or toes? Have the giants really lived, and if so; why don't we find bones after them? Does the authorities really try to hide the true story of our ancient past? Has outer space anything to do with this - do we come from the stars? Or is the simple truth that the stories about the six fingered giants and gods are nothing but fantasies and fairytales? Come on folks - send me facts, pictures and theories! My name is Terje "Terry" Dahl, and I am a Norwegian citizen. I have sailed single-handed to the Pacific and lived several years on an atoll in the remote country of Tuvalu. I have a keen interest in the old culture of the South Pacific, and I also like to keep an open mind to the ancient mysteries of our world. And luckily for me: These two topics very often blend! Send an e-mail to somebody: "Why do they have six fingers - and why is it a secret?"